NetAlarmed is the Australian Government's new Internet filtering technology. Unlike previous Internet safety campaigns such as NetAlert, NetAlarmed levels the balance between safety and freedom. Set for introduction in all Australian homes, workplaces, schools and libraries in 2008, this website aims to inform how NetAlarmed will protect you and your family. Even with a censored Internet, your children are not protected. As a parent, monitor your child's web activity today so when they turn 18, they don't have to ask you, what was the Internet. The new DIY Home Clean Feed kit. 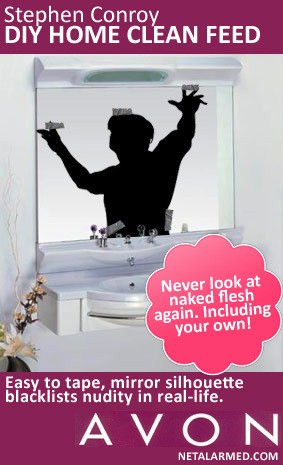 JANUARY 4, 2008, CANBERRA - After an overwhelming response to his tips on Clean Feeding your entire life, Mr Conroy announced he will release his trademark mirror silhouette kit on the retail market. "At first I thought the idea was a little bit wacky" said Mr Conroy. "The whole idea of sticky taping paper to mirrors could seem outrageous to a lot people. I was wrong. People are lining up to buy my new DIY kits. Even more proof you shouldn't listen to people if they tell you your ideas are insane." - One life size body cutout. Fits all. - Five strips of durable, A grade sticky tape finished in a deluxe silver coating. - Instructional video cassette starring Mr Conroy (Rated PG). - 3 year warranty (or however long the ALP remain in Government). The Stephen Conroy DIY Home Clean Feed kit is available through AVON now at the mega low price of just $49.95. This website is fictional. It is a work of satire in response to Australian Government's absurd Internet censorship policy and the former NetAlert policy. Despite national criticism from industry groups, professionals and citizens, Kevin Rudd and Minister for Broadband, Communications and the Digital Economy, Stephen Conroy, plan to implement mandatory internet filtering in 2008. The dangers of Internet censorship outlined here are real. Educate your children about the internet just as you would warn them about the dangers of everyday life. Australia does not require a Government babysitter. Contact NetAlarmed. Please visit my blog, Somebody Think Of The Children if you would like to find out more information about Internet Censorship in Australia or NetAlarmed.